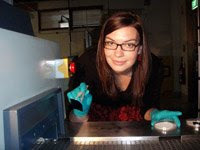 Australians have a new favorite scientist: 23-year-old graduate student Nicole Kuepper has won the People's Choice Award in the Australian Museum Eureka Prizes. It's actually a double win, since she's also receiving the British Council Eureka Prize for Young Leaders in Environmental Issues and Climate Change. "Nicole's iJET solar cell will potentially bring affordable electricity to the poorest people in the world, but more than this, it will be clean and renewable." Current production techniques for photovoltaic, or solar, cells make them expensive, but the iJET can be made without high-tech environments or components. An advocate of green technology, she gives talks about solar energy to the public, has held miniature solar car races to teach indigenous children about renewable energy, and was a delegate at the 2020 Youth Summit in Canberra in April. It's understandable how the technology and Kuepper caught the public's imagination. She's so young! That's amazing. I am glad she won... even if she did make me feel old.